I so enjoyed writing using yesterday’s prompt, Beyond the Pale; I had two ideas pop into my head at the same time. While yesterday was about the hike from hell, today I tell you another little story about my crazy fear of heights. 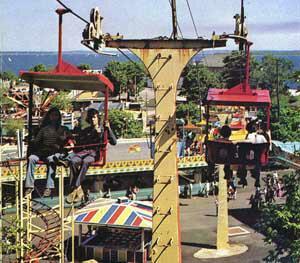 When I was a kid, like just about any kid in Rhode Island, I made the annual trip to Rocky Point amusement park with my family. There were seasons when I was able to go more than once over the summer; with a Girl Scout troop, a church group, or just a bunch of friends. There was one particular trip that I’m pretty sure was when my fear of heights was created. I have no clue how old I was when I took a ride on the “ski lift” around the park. My dad was beside me letting me know we were okay. All I really remember is feeling a sense of dread; was it because my feet were no longer touching the ground? Was it because the turn to go back down was up on in hill in the woods and I couldn’t see my mom? Was it because I was so scared, I’d peed my pants–literally, and had to sit in cold, wet shorts on the metal seat until we got to the bottom? Regardless of the reason, on any subsequent visits anyone was hard-pressed to get me on an amusement park ride that took me off the ground. 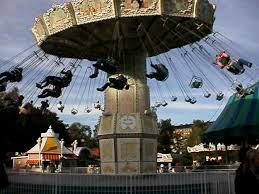 I did continue to ride the Flume, the Music Machine, but never again did I get on the Ski Lift. In fact, I don’t ski on snow because I didn’t want to get on a lift! In 1999, the place I was working hired one of those traveling carnivals with rides to provide entertainment for about 1,000 kids. As staff we were expected to go, of course; but ride the rides…you can tell what my likely answer was to that invitation. However, once again I was talked into something that was well outside of my comfort zone! Alissa and Ray were getting ready to jump on the swing ride, the one that as the ride increases in speed the swings go all out to the side; it’s a physics thing from what I’m told. I wasn’t a kid anymore, it looked like a reasonable ride. “I could do this,” I thought to myself. So what if I kept my eyes closed for most of the ride, and they had to pry my white-knuckled fingers from the handle bars to get me off the seat when the ride ended. I DID do it! Thanks to Alissa and Ray! ← Beyond the Pale: Well Yeah, But Never Again!